Home » Featured » Dorothy Day – A Saint for the “Occupy Era”? Dorothy Day – A Saint for the “Occupy Era”? 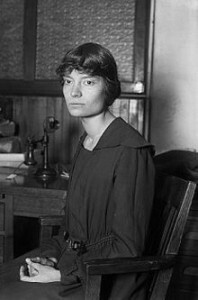 Dorothy Day (1897 – 1980) was a journalist, essayist, a founder and the main spokesperson for the Catholic Worker movement that began in the 1930’s in the United States. This movement espoused nonviolence, pacifism, and who worked directly with homeless and poor people. Day helped set up “Hospitality Houses” and communal farms as means to help them directly. She was a strong advocate of traditional Catholic religious and moral positions, was strongly influenced by traditions of Francis of Assisi and early 20th century French Catholic social liberalism, and also had a strong political anarchist streak. Not trusting government to act according to moral purpose and as distrustful of socialism and communism as private capitalism, Day advocated “distributism” –society’s goods should be distributed widely among many people not from a centralized bureaucracy but by the people themselves. I lifted this profile’s title from an article by Virginia Cannon from the New Yorker late in 2012. At that time Dorothy Day has been promoted for eventual canonization in the Catholic Church, a cause taken up by the very conservative prelate of New York, Archbishop Timothy Dolan. This is especially noteworthy since Day espoused pacifism and left-wing causes throughout her life, was part of the leftist movement during and after World War I, who had a marriage and divorce and an abortion, and who wrote against the Catholic Church’s complicity in the perpetuation of an unjust social and political order. Day was the daughter of a middle class family that lived in different parts of the country when she was growing up. She was an avid reader from the beginning; as she grew up she read lives of saints, Russian novels, and was particularly fond of the writings of anarchist Peter Kropotkin. After leaving college in Chicago after two years she moved to New York and became involved in the socialist and communist communities there, joining the Wobblies and becoming friends with John Reed, Eugene O’Neill, and others. She worked on the staff of various left-wing publications and in the 1920’s moved around and drifted between jobs. She had a short-term marriage, on the rebound from another relationship that ended when he left her after she had an abortion (at his request). From a nonreligious family she was very interested in religion from an early age and as a young adult she moved toward Catholicism. She was in a long-term relationship, became pregnant again, and her daughter was born in 1926 or 1927 (I’ve seen both years in sources). Decision-time occurred in the summer of 1927 when she decided to have her daughter baptized as Catholic. She had already begun the process of converting to Catholicism and she was baptized at the end of 1927. At that time the romantic relationship with the father of her daughter ended, since they were not married and he refused to marry, and they drifted apart over many years. Let’s stop look at her chart, since by now no doubt you’re curious. First let’s look at it without the outer planets so they don’t distract us from the personal planets and what they have to tell us. The house system is Whole Sign Houses, of course. 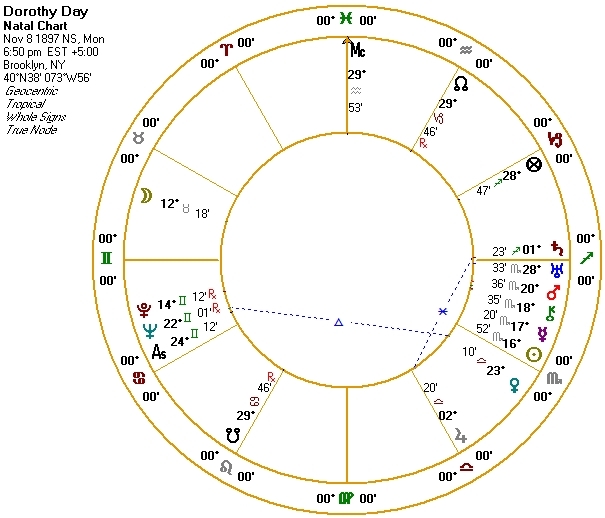 Day’s rising sign is Gemini, a sign that typically comes to mind when we think of good writer and communicator Mercury is in Scorpio, moving away from the Sun and joining a very powerful Mars in Scorpio. One could call her “a Scorpio’s Scorpio.” Her Mercury placement, the ruler of her Ascendant, shows us her knack for advocacy journalism and the polemical essay. Mars is in its domicile also in Scorpio, is in its House Joy in the 6th (especially helpful with adversity), and is in sect in her nocturnal chart. Mars’ sole drawback is being under the Sun’s beams, but this is surely a Mars that can hold its own, especially since it is the ruler of her Sun in Scorpio. The strong connection between Mercury and Mars tells us not only about her personal intensity but her uncompromising and unyielding attitudes – she continued to be a pacifist even through World War II, during a time of great public criticism of her and her magazine lost two-thirds of its circulation. She also applauded the anti-materialism of the radical movements of the 1960’s but had no patience with its aura of sexual liberation and drugs and she was uncomfortable with the new feminist movement. 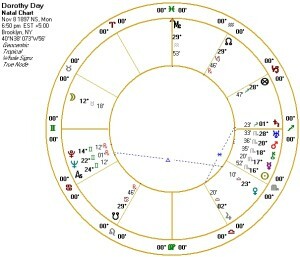 Contrasting Day’s strong Scorpio are Venus and Jupiter in Libra in her 5th house. Venus, also in sect in her nocturnal chart and rising from the Sun, has the added advantage of being conjunct Spica (also co-culminating and anti-culminating): all this gives Venus a larger capacity to attract people to her and for her to experience many joys in life (even if she was celibate and practiced voluntary poverty most of her adult life). Together with the strong Scorpio placements in Day’s chart, the added factor of Venus could give her both effectiveness and charisma. Jupiter is the critical planet in her chart, even more than Mars. Jupiter is out of sect but is oriental to the Sun, is happily placed in the Fifth House, is the dispositor of her Lot of Fortune and Spirit in Sagittarius (and both in the 11th sign from them), and also the ruler of her 10th house of career (as opposed to her Midheaven degree that’s in her 9th). We know Jupiter to be about ideas, but that’s only part of Jupiter makes connections between the individual and the wider world. One detects a strong idealism in this Jupiter placement, especially since Jupiter’s dispositor is Venus in the same sign. Day’s advocacy of pacifism (especially during World War Two), distributism, with its longing for global spiritual regeneration, may strike the reader as sheltered in illusion. Yet she was not naïve, especially if we also include her willingness to go to jail in the expression of her positions (from a women suffrage demonstration in her youth to joining Cesar Chavez in the 1970’s to work for farm workers. As the ruler of both Lots of Fortune and Spirit, Jupiter has had much to do with the many phases of her life and the strong choices she made. Moon in is exalted in Taurus but is more inaccessible to her because it is in the 12th house. We tend to think of Taurus as comfortable and sensual but, if she had some of those qualities, they were secondary to her Mars-like intensity. During the summer of 1927, when she had her daughter baptized Catholic and had decided to become one herself, transiting Jupiter and Uranus were in Aries exactly opposing her natal Jupiter in Libra and Saturn was stationing at the same degree of her natal Saturn. This looks like a fine time for a “Saturn return”. On top of this, in the beginning of 1928 she also had a Progressed Full Moon. This all made for a decisive turning point in her life. Here’s her chart with the outer planets. Pluto and Neptune are both in her First House. 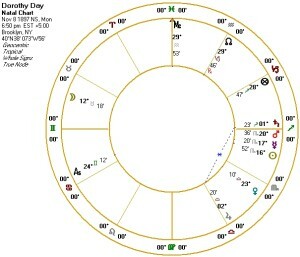 Especially important is Neptune’s close conjunction with her Ascendant degree and its close trine to Venus. If it was Mercury with Neptune she would have been more ideological and less personal; the presence of Venus allowed the Neptune idealism to be more personal and more compassionate. This brings me to Chiron. People who are familiar my work have I hardly ever seen me use Chiron. This is mostly because I cannot make interpretive sense of it for most people I have worked with. But it is different with Dorothy Day, for here Chiron comes across like a sledge hammer. Placed with Sun and Mercury and very close to Mars, Chiron helped Day become a personal example of her own vision and perspective on society and culture. I have seen people talk about their own Chiron placements to assert their transformative nature but for most people it just isn’t true. This time, for this person, it certainly was. I want to leapfrog to the end of 1932, for the launch of the activist career that would determine her life path. First here’s some historical background. In the autumn of that year Franklin Roosevelt was elected President and the Great Depression was at its worst. There were also some important mass demonstrations including the Hunger March that marched on Washington, advocating for some basic reforms. Day covered the Hunger March as a journalist for Catholic. When she returned from New York she met a wandering Catholic social advocate, a Frenchman named Peter Maurin. It was this meeting that began the process that launched the Catholic Workers movement. Maurin had the better theoretical background and was steeped in Catholic social commentary. Dorothy Day, however, had charisma, social adeptness, and ability to communicate well. She was also a very quick study. Within a year they had established numerous Hospitality Houses in New York, had communal farms in the planning stage. In May 1933 The Catholic Worker had its first publication and Day was on her way toward becoming a public figure, albeit a radical one. From an astrological point of view we would look for Mars to be active at this time. Mars does not show up in her transits, although her transits are not without significance. During the end of 1932 transiting Jupiter in its retrograde station in square to her Neptune, and in the spring of 1933, the following Jupiter direct station was squaring Pluto. In her case this would indicate first a re-awakening of inspiration (Jupiter-Neptune) and a later development of taking things into her own hands (Jupiter-Pluto). Both transits are made personal and powerful by natal Neptune and Pluto being in her First House. 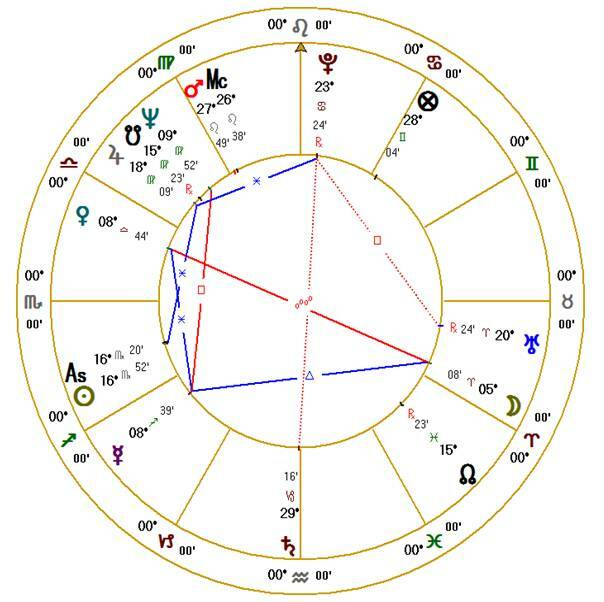 There were also transits that marked the end of her personal life as she would know it: transiting Saturn was squaring her Moon and a Uranus/Pluto square was transiting her Venus. This ended any hopes of a relationship with her daughter’s father and brought her into a life of hard work, celibacy, and voluntary poverty. Her progressions and solar arc directions are not conspicuous at this time. However she had a fascinating solar return. Her 36th year began a month before the march on Washington and her meeting Peter Maurin. Her “lord of the year” – the ruler of her yearly profected Ascendant – is Moon that looks pretty innocuous in the 6th until you see its applications to Mercury and Venus simultaneously, both at 8° of their respective signs. It connects both to her life with people and her life of ideas. 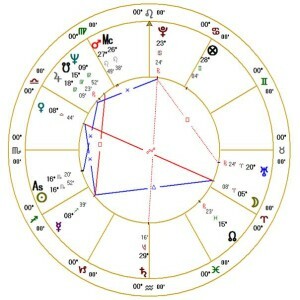 Jupiter is placed in the 11th and is in sextile to both Sun and Ascendant. Here Jupiter’s being in Virgo perfectly describes the situation – to accomplish her purposes, much practicality and focus is required (qualities Maurin lacked but she had abundantly). This is augmented by her decennials for this time. In 1927 her general (mistakenly called “major”) planetary lord was Venus and her specific (mistakenly called “minor”) planetary was Moon. 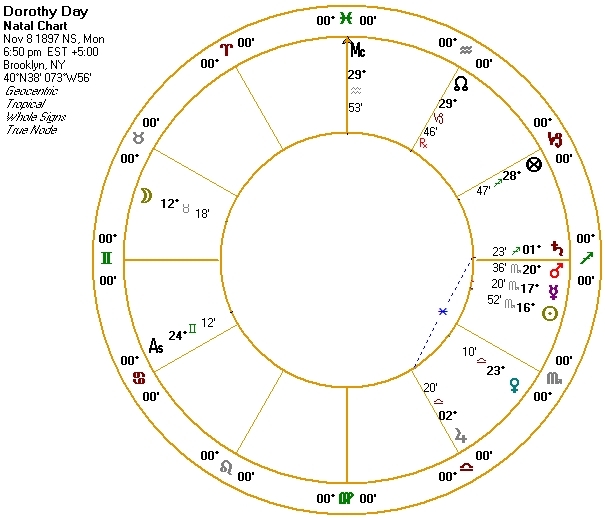 However, in the middle of 1929 her general planet lord changed from Venus to Sun; Sun and then Mercury took over as specific planets, followed by Mars – in November 1932, the month of the march on Washington! It is time to conclude this profile of this fascinating person. Let’s see if we hear much about her next week.